Our vineyards are located on the land called the "Aspres", between Perpignan and Spain. This soil is characterized by clay and gravel quartz, metamorphic and sedimentary rocks resulting from such schists, quartz, limestone ... which gave birth to the famous Pyrenean alluvial terraces in the red and ocher colors. 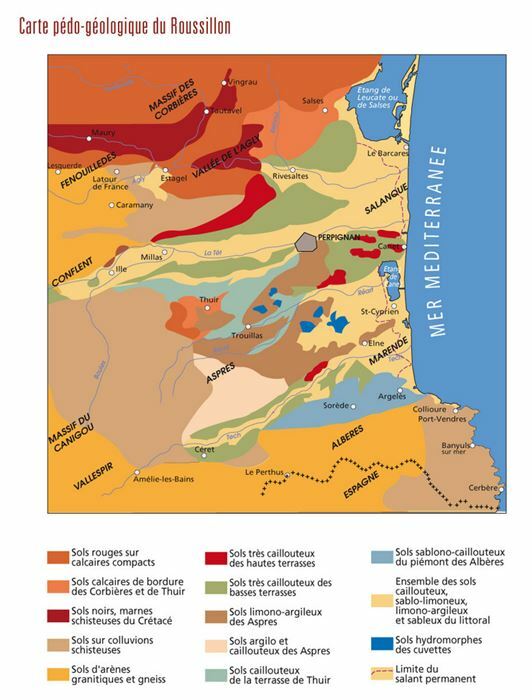 A unique climate, punctuated by the Tramontana, wind very present in this region between sea and mountains which fosters the well-being of our vines to grow the typical grape varieties of Roussillon and ensure healthy crops without additional input. Arid area of the Pyrenees Orientales, with mild winters, the region low rainfall explains why these wines have so many characters. This soil, thankfully, concentrates in the subsoil the scarce water resources it receives. The sunny weather, dry and windy, together with the soil structure, allows low yields promising intense flavors and expanded structures for outstanding wines from grapes ripeas early as August. Guardians of the know-how and the Catalan wine making practices, our grape varieties are traditional and cultural from the Roussillon. We turn to wine each one separately to express with the least possible deviations the tremendous potential of the grapes. The Syrah, whose oldest vine is no less than 30 years old, provides intense color to the wine, round and powerful fragrances. The Mourvèdre with raw aromas and strong personality. Fruity and spicy in his youth. Powerful, flexible and elegant with age. The Carignan, the average age of the plots is 60, the oldest vines are 138 years old to date. Carignan develops powerful, rustic and colorful wines. The gray Grenache is endemic to our region. Favourable towardsthe creation of structured and round white wines with citrus flower honey notes. The white Grenache from very old plots, the oldest one being 80 years old. Strong personality. Beautiful generosity. The black Grenache, the average age of our vines is 60. It produces wines of character, honest and colorful. Intense black fruit flavors. The Macabeo is specific to Catalonia, often very productive but we work to get a very low yield in order to give birth to exclusive cuvées. The Muscat à petits grains with very low yield. Unique expressions of citrus and tropical fruits. The Muscat of Alexandria, powerful and heady aromas.